Vanilla mango mousse cake has all the goodness of cake and mousse immersed in mango flavor. 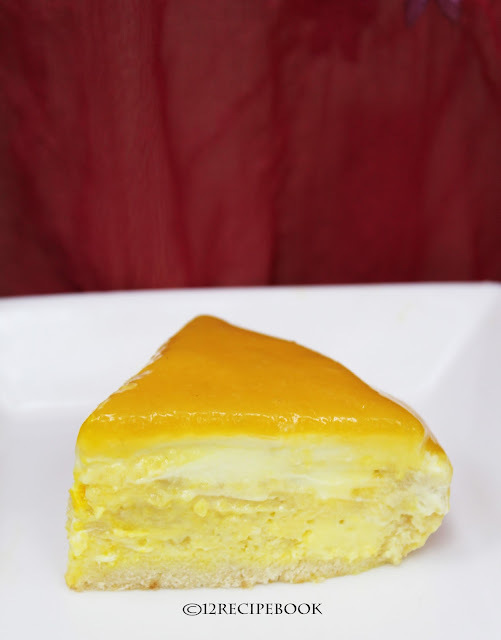 It is an extremely delicious combo with vanilla cake and mango mousse. 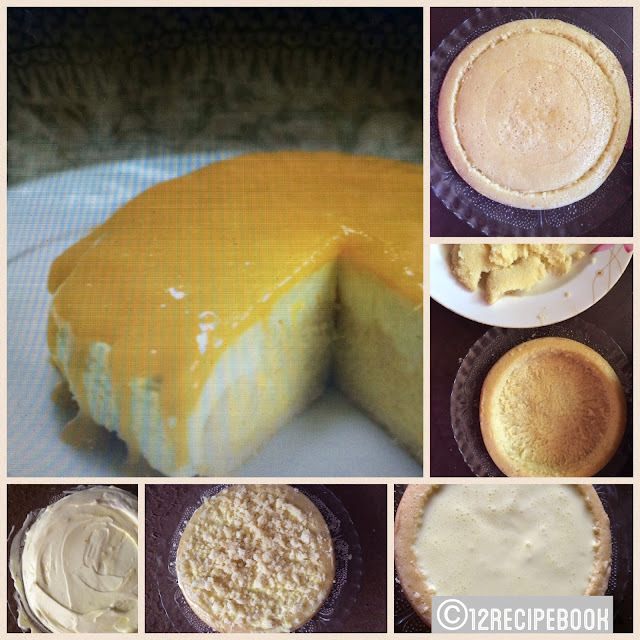 We need to prepare a vanilla cake (Or use store bought) and mango mousse. Then fill the prepared mousse inside the cake and top it with cream. All ingredients for the cake must be in room temperature. Pre-heat the oven at 180 degree for about 10-15 minutes. Grease the baking tray with little butter and sprinkle some flour over it. Sift flour, baking powder and salt together for two time.Keep aside. In a large beat ghee and powdered sugar until pale and creamy. Add egg one by one and beat well. Add flour and milk alternatively by three additions with a spatula by folding in one direction. Pour the batter quickly in to the greased baking tray. Bake it in the pre-heated oven for about 30-35 minutes or until a skewer is inserted n the centre of the cake and check whether it comes out clean. Mix gelatin with 3 tbsp of water and mix well; rest for 10 minutes. After that double boil it until clear water formed. Allow to cool. Beat fresh cream and powdered sugar until soft peaks forms. When the gelatin gets cooled; add it in to the mango pulp and mix well. Fold the mango pulp with the cream mix. Chill for half an hour before using. Using a sharp knife make a well in the cake without touching its bottom part as shown in the picture. Keep the take out cake crumbs for further use. 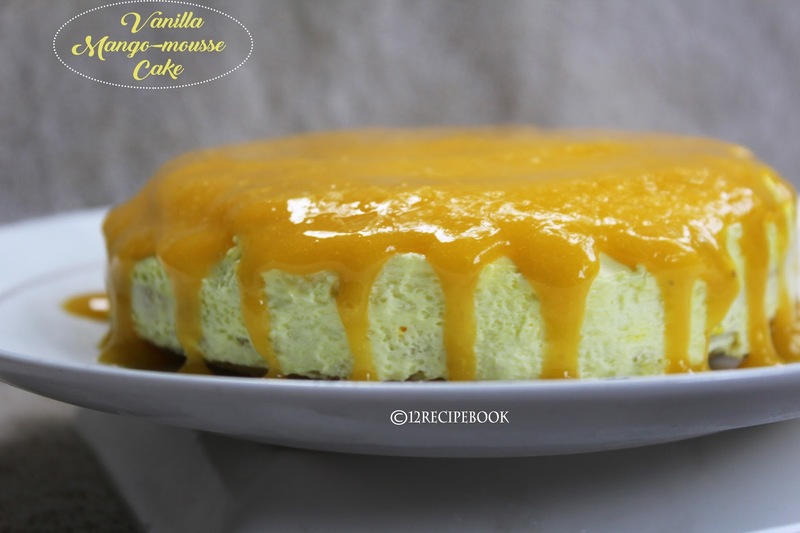 Fill the well with prepared mango mousse. Chill the cake for an hour in fridge too set the mousse inside. After that cover the mousse top with cake crumbs. Top it with whipped cream evenly. Refrigerate for another an hour. Pour the mango glazing on top and chill for another 15 minutes. Cut in to pieces and enjoy the surprise mousse cake!! !